Phillip Tsosie Sterling Bracelet size 6 1/8"
Phillip Tsosie married into the Tahe Family and works in the style of the Tahe Family in making bracelets. The Tahe Family is a large, extended group of prolific jewelrymakers who specialize in making Sterling "component bracelets." These bracelets are created by using prefabricated Sterling components such as twist wire, half-round wire, low dome wire, triangle wire, etc. In some cases, stampwork is added to the design. These bracelets are not characterized by the master smithing techniques (intricate stampwork, setting of stones, creation of repoussée forms, etc.) used by many of the artists on our site. 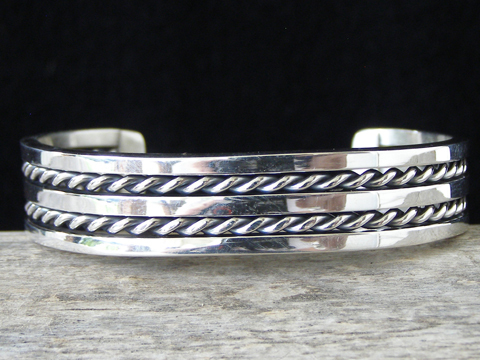 They are, however, typical Navajo Sterling silver bracelets at a very reasonable price showing a Navajo "eye" for design. Hallmarked P.Tsosie Sr. and stamped Sterling inside. Terminal to terminal: 5 1/8"
Total inside circumference (including gap): 6 1/8"